>>>- The whole RISC idea. It worked well… in every other market segment! >>instructions is completely dead. I don't know of a new CISC ISA being designed since, what, the late 80's? >Really I was kinda fishing for #2 and 3. It was past 5 am here. I didn't even remember I was up that late last night! >finally gotten the whole monopoly. 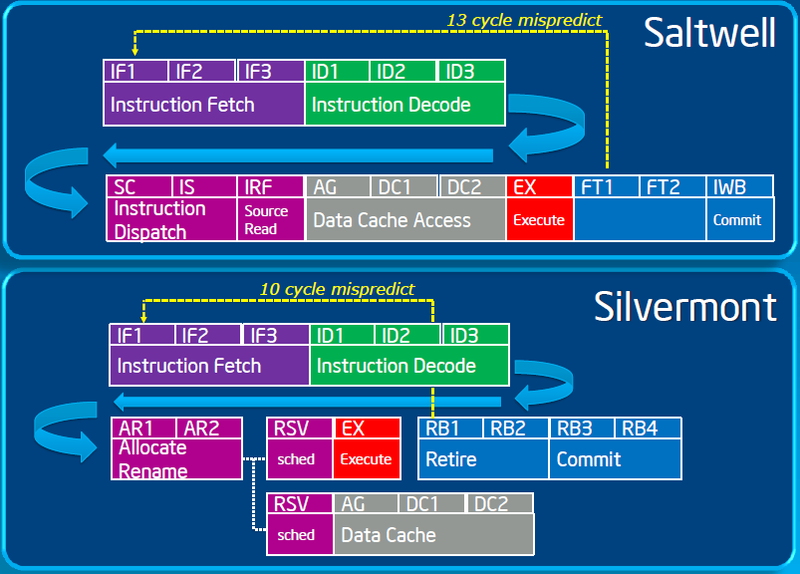 x86-64 is more RISC, sure… but not really RISC. >Mathematical beauty be damned, treading water is the right way after all. >are more equivalent than anyone realized in 1992. Initially x86 was a relative cheap CPU; therefore, it had to be fairly simple; therefore, while x86 had some CISC features/flaws it never embraced the worst excesses of CISC. Out of necessity x86 was a moderate CISC - making it something of a comprimise between RISC and CISC, and thus making x86 a very poor example of CISC. The best example of CISC, and why the CISC ideals are well and and truly dead, is probably the DEC VAX. RagingDragon (a.delete@this.b.c) on September 28, 2009 2:58 pm wrote: > Potatoswatter (potswa_m@c.com) on 9/26/09 wrote: > --------------------------- > >Wilco (Wilco.Dijkstra@ntlworld.com) on 9/26/09 wrote: > >--------------------------- > >>Potatoswatter (potswa_m@c.com) on 9/26/09 wrote: > >>--------------------------- > >> > >>>- The whole RISC idea. It worked well… in every other market segment! > >> > >>You meant CISC surely. The idea of "closing the semantic gap" with ever more complex > >>instructions is completely dead. I don't know of a new CISC ISA being designed since, what, the late 80's? > >> > >>Wilco > > > >Really I was kinda fishing for #2 and 3. It was past 5 am here. > I didn't even remember I was up that late last night! > > > >I'm not denying the value of RISC principles. But I don't think, in retrospect, > >we can really say RISC is the whole answer. In the microcomputer segment, x86 has > >finally gotten the whole monopoly. x86-64 is more RISC, sure… but not really RISC. > >Mathematical beauty be damned, treading water is the right way after all. > > > >Of course x86 wasn't designed as it should've been, but the encoding strategies > >are more equivalent than anyone realized in 1992. > > Initially x86 was a relative cheap CPU; therefore, it had to be fairly simple; therefore, while x86 had some > CISC features/flaws it never embraced the worst excesses of CISC. Out of necessity x86 was a moderate CISC - > making it something of a comprimise between RISC and CISC, and thus making x86 a very poor example of CISC. > > The best example of CISC, and why the CISC ideals are well and and truly dead, is probably the DEC VAX.